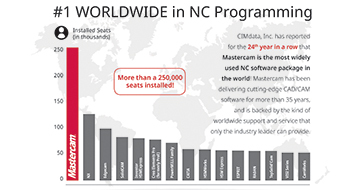 “Mastercam topped the list in both the educational and industrial categories, with nearly twice as many installed seats as the nearest competitor*. Meghan West, President and CEO of CNC Software, Inc., stressed the importance of Mastercam’s leadership in both categories. Mastercam provides incomparable access and support for shops and programmers. As a manufacturer, if one is looking to expand, they can find experienced talent, and as a programmer, one can always find a shop that uses Mastercam. With more shops using Mastercam and more schools teaching Mastercam, students are being prepared for a fluid transition to the job market with practical skills and reduced learning curve. This is a win-win situation for education and industry to contend with the skills gap and fill the glut of jobs available in manufacturing. West also shared that Mastercam’s dominance in the educational market, more than the next two competitors combined, is a strong indicator of continued leadership in the field of CAM software. “When we say that Mastercam is Shaping the Future of Manufacturing™, we are talking about more than technological advancements. We are talking about our commitment to an incredible array of schools, educators and organizations, working with our global support network to make sure students of all ages are introduced to opportunities in manufacturing and taught the programming skills necessary for meaningful employment.” West added further. “This accomplishment really demonstrates our complete dedication to the worldwide manufacturing community. And while it’s an honor to be recognized as leaders in the global market, I’m excited for the opportunity to thank our users. It’s their feedback and input that helps us develop Mastercam responsively—to stay at the forefront of manufacturing technology and productivity year after year. We wouldn’t be number one without them!” West concluded.